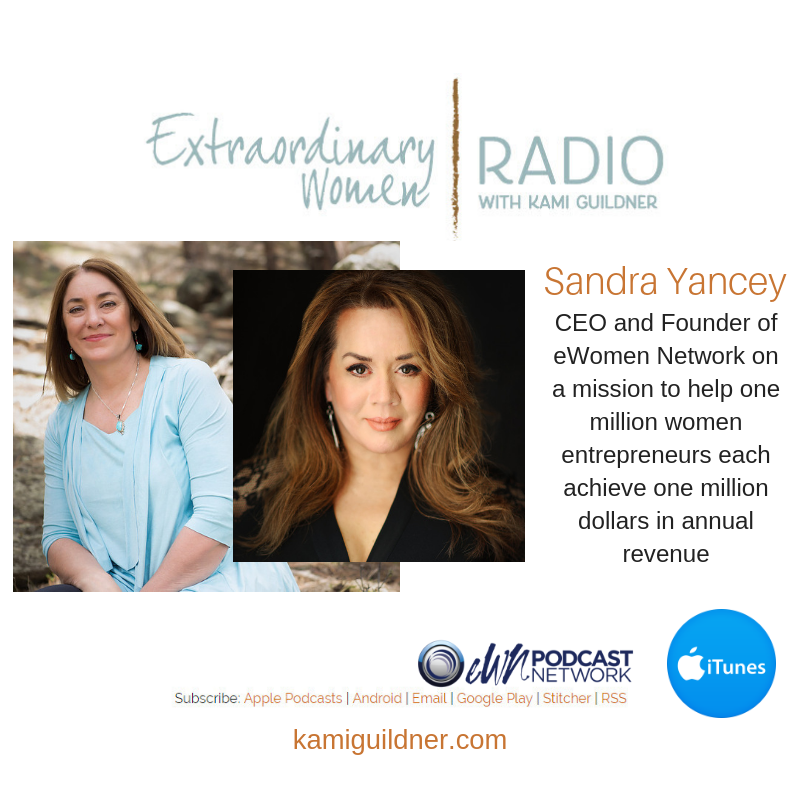 I am so excited and honored to bring you today’s Extraordinary Women Radio interview with Sandra Yancey. Sandra Yancey is on a mission to help one million women entrepreneurs each achieve one million dollars in annual revenue! She is an award-winning entrepreneur, life and business transformation specialist for the Emmy award-winning TV show “The DOCTORS,” multi #1 bestselling author, movie producer and philanthropist. Sandra is the Founder and CEO of eWomenNetwork the premier women’s entrepreneur business community with over 500,000 women connected through 118 chapters across North America. Sandra is recognized by the International Alliance for Women as one of the world’s 100 Top Difference Makers and by CNN as an American Hero. Two years into her business she was on the verge of bankruptcy and ready to close her doors. Not one to give up, she found her grit and today leads one of the most successful multi-million dollar women’s business networks in North America. Sandra is the preeminent women’s business expert teaching women how to RISE and succeed in spite of everything. In this episode, Sandra shares this story and the story behind the inspiration that sparked eWomen Network eighteen years ago. This is a must listen episode, as Sandra shares so much entrepreneurial wisdom. She talks about the importance of “managing your boundaries, not your time,” and covers the foundational pillars of building a 7-figure business: people, priorities, plate, product, processes, and performance. Sandra is passionate about uplifting women. You can learn more about Sandra at eWomen Network and the EWomen Network Facebook page or follow Sandra on Twitter or Facebook or Instagram. Let’s meet the dynamo Sandra Yancey of eWomen Network!